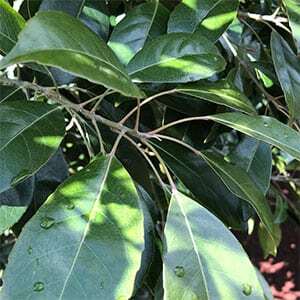 A versatile landscaping tree, Elaeocarpus eumundi is often grown for the foliage. Large leaves add a touch of the tropics to a garden design, so if you are after that tropical look, this could be the tree for you. In its natural climate range it is a tree that will reach around 15 metres in height. In cooler climates, height is around 1/3 of this depending on position and soil. The new foliage is particularly attractive being a bronze to red in colour. Older foliage is smooth and glossy, hence the common name of Smooth Leafed Quandong. The height of this tree will depend on climate, soil and moisture. In both warmer cooler areas in grows well in a humus rich soil with adequate moisture. In cooler climates with dry summers it is recommended to mulch well around the plant to maintain a moist root run. It is a tree that responds well to pruning, if you are trying to restrict the growth, prune regularly from a young age. A little organic fertiliser applied in spring will improve growth rate and overall performance. Elaeocarpus eumundi can be grown in containers for a number of years and growth rate will be restricted. Common Name – Eumundi Quandong, Smooth leafed Quandong. Height – To around 15 metres, much smaller in cooler areas. Growth rate – Slow to medium in good conditions. Foliage – Mid green and serrated on the leaf margins. Flowers – Small and white and perfumed.